Looking from east to west this view captures many of the distinctive buildings of downtown Calgary. 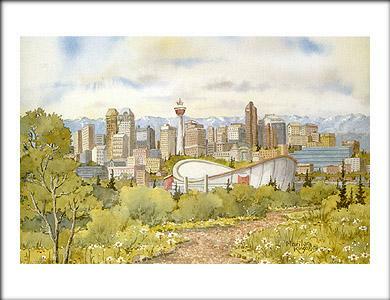 Prominently in the foreground is the noted Saddledome showing the Calgary Tower. The Banker's Hall Twins, Petro Canada, City Hall, Telus, and the Delta Hotel are among many others easily identified. One of the noted features of Calgary are the red clay walking and jogging paths. As the artist I took the liberty of placing the Saddledome in a park-like setting with the shale path leading towards it. Artisic license was also used to evaluate the distant Rocky Mountains. On a clear day they can be well seen.